Dylan has been recently more forthcoming about his early influences.In both his authobiography, Chronicles, and the documentary film No Direction Home,he talks about the effect tha reading Kerouac had on him. He says that "On the Road", "had been like a bible for me.I loved the breathless,dynamic bop poetry phrases that from Jack's pen...I fell into that atmosphere of everything Kerouac was saying about the world being completely mad,and the only people for him that were interesting were the mad people,the mad ones,the one who were mad to live,mad to talk,mad to be saved,desirious of everything at the same time,the one who never yawn,all of those mad ones,and I felt like I fit right into that bunch." But Bob Dylan adds : "One guy gave me a book that Woody Guthrie wrote called "Bound for Glory" and I read it. I identified more than I even did with "On the Road". 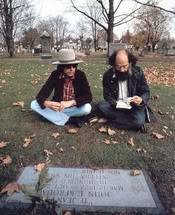 When Allen Ginsberg was travelling with Dylan on the Rolling Thunder Review tour of 1975 they visited Lowell,Massachusetts and stopped by Kerouac's gravestone at Edson Cemetery,where in a scen which appeared in the movie 'Renaldo and Clara',they read choruses from Kerouac's Mexico City Blues. Ginsberg asked Dylan how he knew Kerouac's poetry and he replied : "Someone handed me Mexico City Blues in St.Paul (Minnesota) in 1959 and it blew my mind.It was the first poetry that spoke my language. "Dylan mention Mexico City Blues in his song 'Something's Burning,Baby' from the 1985 album Empire Burlesque. Kerouac's influenced can also be heard on Dylan's earlier album,'Highway 61 Revisited.Two of the songs 'Desolation Raw' and 'Just like Tom Thumb's Blues inlude direct quote from Kerouac's novel 'Desolation Angel's',inlcuding the phrases "the perfect image of a priest", "her sin is her lifelesness" and "Housing Project Hill".It is also informative to compare the song title 'Desolation Raw' and the phrase 'junkyard angel' (use in another song in the album from a Buick 6) with the title of Kerouac's book.